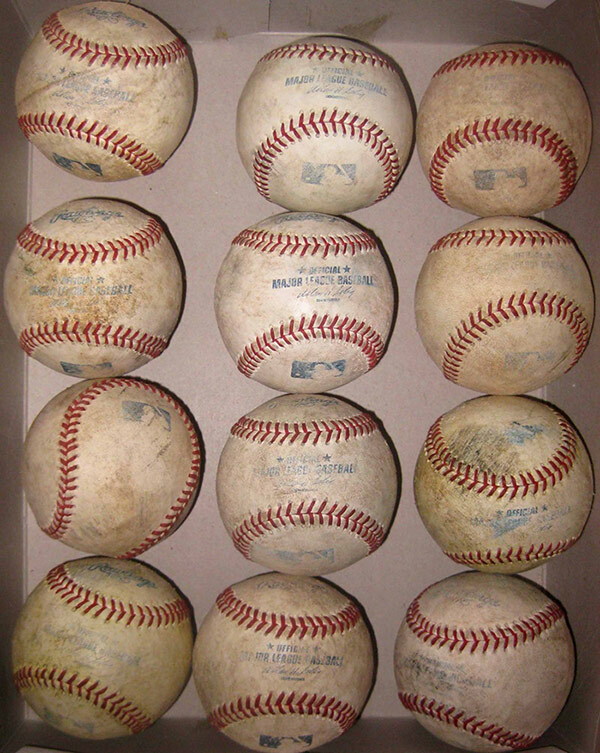 On ebay there is regularly someone selling a box of game-used Major League baseballs. The photo accompanying this listing offers great visual interest. In fact, it would serve as a good example to any Foundational Art course. Repetition. That’s easily noted. You wanna be an artist? A reliable foundational technique is repetition. The inherent order provides framework for variety within. Compare the textures from baseball to baseball. Compare the presentation of the seams. Most of these show the “face” of the baseball with slight variations to their angles, but it’s interesting to see the one baseball that’s completely off. Breaking the repetition is another great tool. The photo was taken with the box lying down, but look at the photo as how it’s presented: vertically. All the balls, but one, look to be stacked on one another. That one ball in the upper left corner adds an incredible sense of mystery and thus intrigue. It’s just floating there. Remarkable. This effect is attained only because the photograph is cropped in such a manner so that only the box interior and the balls are showing.